Wielded TPU reinforcement is one of the fabulous features in this athletic shoe, which is structured with a larger forefoot to give you quicker transitioning ability from one foot to the other. An overlasted forefoot on the top front of this shoe compliments the abilities of these Under Armour shoes for men, along with the performance mesh and foot sleeve (which reduces the tongue sliding). The Additional design features in these shoes improve the cushioning and absorb shock to the heel and joints of the forefoot. Testimonials praise the shoes for being extremely comfortable, durable and 'ready to go’. This is a great aspect if you don’t have time in your training to give your shoes a “break in period” for comfort. Available for purchase in sizes 7.5 - 15. This shoe combines a breathable frame, made of mesh material, with durable synthetic leather giving users a shoe that with last and give optimal comfort. It also features what Under Armour calls HeatGear, a lining that keeps the foot cool and exceptionally dry. To improve traction, the shoe is fitted with an outsole made of tough rubber, which also aids in durability. 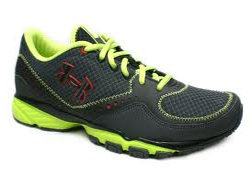 Users report some makes of Under Armour shoes for men, such as this model, feel much smaller than other shoes the line carries. The narrow design, especially at the toe, might make the Ignite II Turf shoes uncomfortable for wider feet. Available for purchase in sizes 6.5 - 15, but only available in black. For running on the toughest terrain, these are the training or running shoes you want. Tactical, yet light, and stable for athletic purposes while still cushioned for comfort. They are the ideal footwear for long and rough travel. The shoe is outfitted with over a half dozen patented technologies, from ortholitesockliner with HeatGear to maintain foot coolness, to Cartilage Precision Handling to reduce shearing force. This model of Under Armour shoes for men truly protects the feet from the shock upon impact while keeping your feet extremely comfortable. These shoes are even promoted by and for police officers, assisting with street and tactical training. This fact alone indicates they are a tough yet supportive training or running shoe. Available for purchase in sizes from 7 to 15.